Militants have destroyed all power mains. 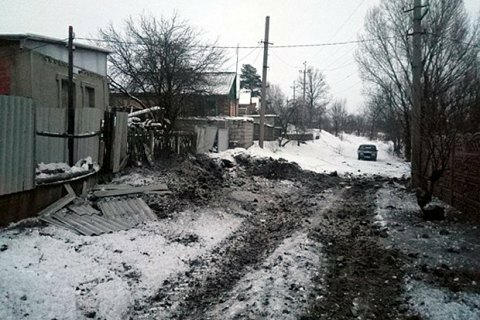 The last power main feeding Avdiyivka was destroyed by enemy fire on Monday evening, leaving the city without water, electricity and heating, the head of the Donetsk regional military and civil administration, Pavlo Zhebrivskyy, has said on Facebook. "The Russiasts have just destroyed the last power feed to Avdiyivka. They have cut the water filtering station and the coking plant that provides heat to Avdiyivka from the grid. The city has no water and electricity supply or heating," he said. The chief of the Donetsk regional police, Vyacheslav Abroskyn, said 25,000 residents are staying in the city. According to one of Zhebrivskyy's Facebook posts, there are 16,000 residents, including 2,000 children, in the city. The air temperature in Avdiyivka dropped to 18 degrees Celsius below zero. "Where the conflict around Ukrzaliznytsya leads?"